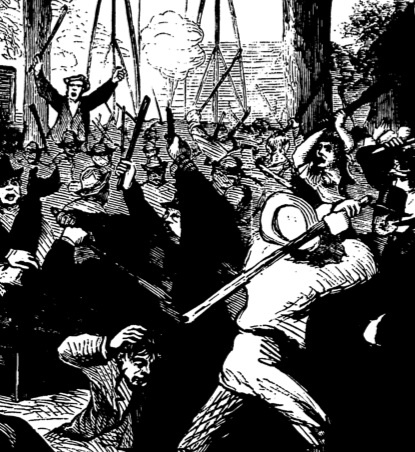 The use of the stick, shillelagh, and cudgel in the violent “faction fights” of nineteenth century Ireland is already well-known through the works of author William Carleton (1794-1869). 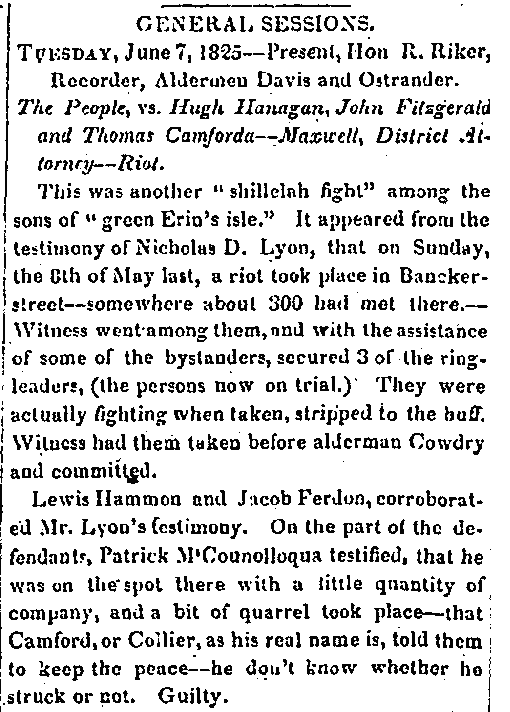 Less known, however, are the historical accounts of such weapons being used in New York City among the street battles of Irish Catholic and Irish Protestant immigrants. 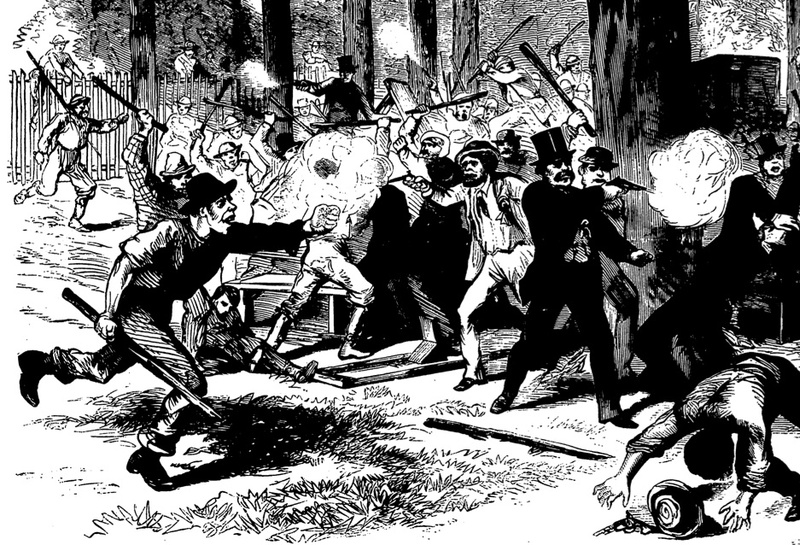 Although such skirmishes were popularized by the film “Gangs of New York” (based on the book by Herbert Asbury), those fights were fictionalized and dramatized to a great degree. 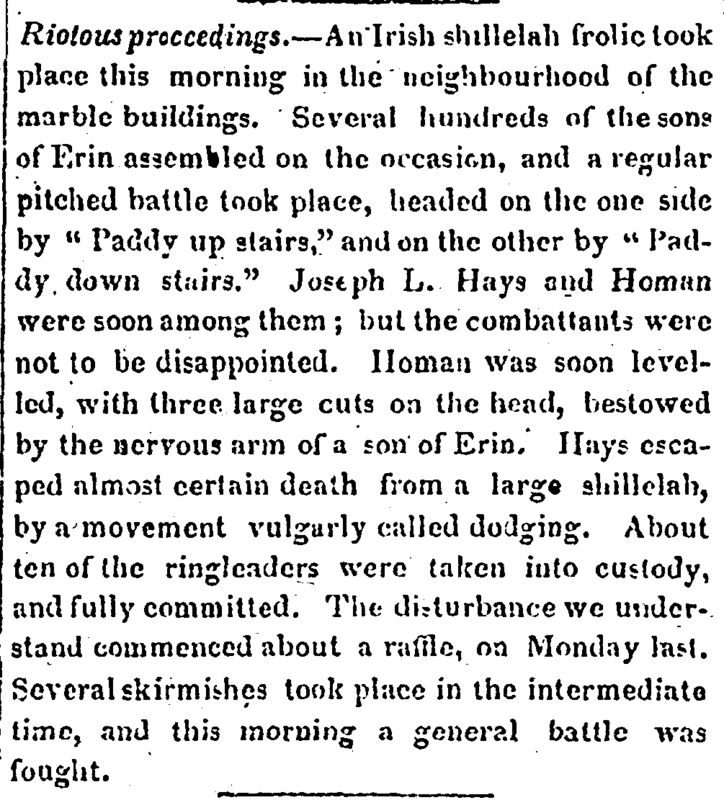 And, in actuality, Irish stick-fighting in New York City dates to nearly fifty years earlier than the events depicted in that book and film. Just how many Irish immigrants brought their blackthorn shillelaghs with them to New York City is a matter of speculation; certainly, there are records of some having done so (particularly Irish American politicians, who would carry them as symbols of their station). During the early nineteenth century, the American press often referred to the sticks used by Irishmen in combat as shillelaghs, however, these may very well have been simple (non-blackthorn) sticks or canes that were acquired in America. 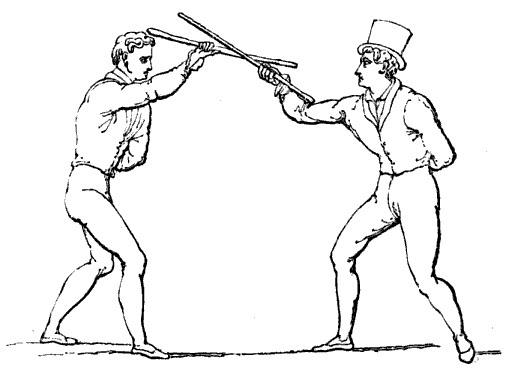 Illustration of Shillelagh technique, from Donald Walker’s “Defensive Exercises”, London: Thomas Hurst, 1840. 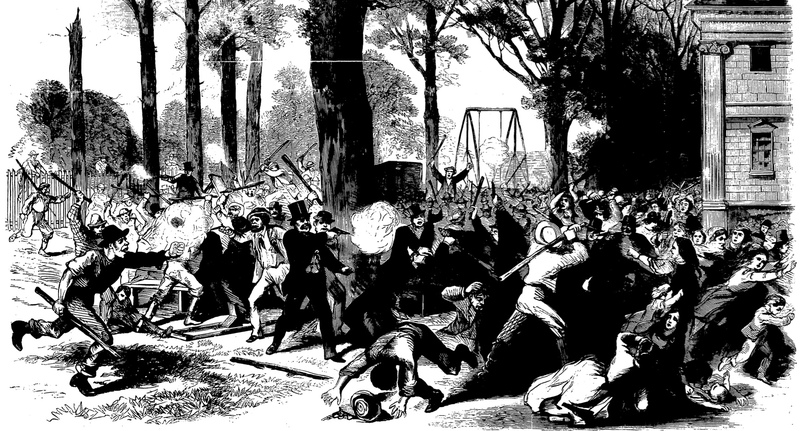 Such riots continued through the Civil War era (when the infamous New York Draft riots exploded, involving a large number of Irish) and well into the 1870s, culminating in a massive clash of Irish Catholics and Protestants on Eighth Avenue. We’ll cover these and more in Part 2 of this article (stay tuned). 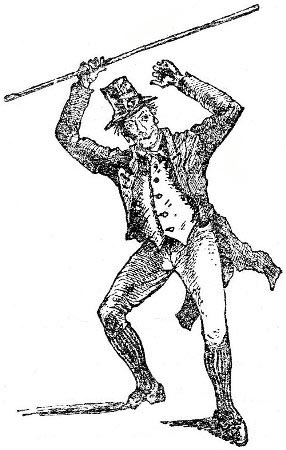 Above: Brandishing a shillelagh. From “Broad-Sword and Single-Stick” by R.G. Allanson-Winn. Hi John–I already have your book on the Shillelagh! Good stuff, thanks! I’m interested in finding a school in NC for bataireacht.